I would love if they had a slash through that sign as if to say “No texting and walking.” I have never seen a sign like that. How very cool and odd! You are so smart, Lois. I didn’t think that way until you said it. And you are right! this is a really fun sign…. thanks for sharing…. Thanks, Yvette. I thought it was interesting… only in Stockholm, I guess. Yes – and i read the comment about having the line through this – to say don’t text and walk – and whew – we still see people text and drive ALL the time! I was telling Perpetua that once I saw a guy brushing his teeth while driving 😉 People do crazy things. I have done the teeth brushing – in the 90s – on a road trip – but dare I say I am a good driver ? Do we all think that? I have written in my journal while driving – that is messed up! But also 90s and also road trip. Anyhow – I never really talked on the phone while driving because I do not like to – and so “not”texting is a bit easy – I might text at a red light – but have really committed to not…..
Yvette! I thought I knew you by now… brushing while driving? I would never thought of you doing that. Ha ha ha… now I have a new picture of you in my head. Lois is right! 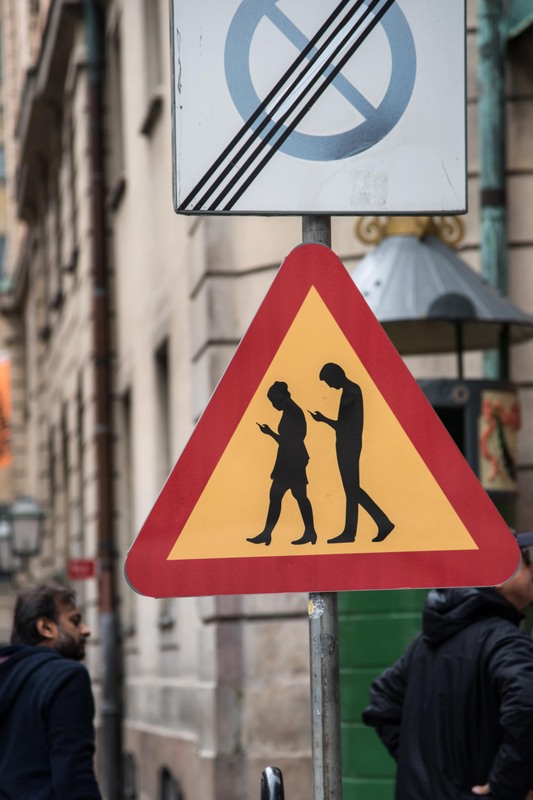 As it is, not sure whether the sign encourages texting while walking, or not. Thanks, Cee. You know what? Your Odd-Photo challenge makes me more observing. Thanks. It’s both odd and a little puzzling. I’ve never seen one like it before and I’m not sure how to interpret it. Thanks, Joanne. I found it in Stockholm 😉 I wonder if it’s a good idea to have it here in US too.